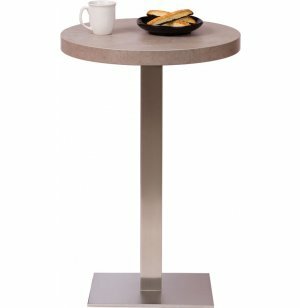 Bar-Height Round Cafe Table - Square Steel Base 24"-dia. This intimate round café table is ideal for small study sessions and coffee breaks. The stainless steel base complements the surface finish. Sit back, relax and take a well-deserved break at a cozy café table from BFM Seating. 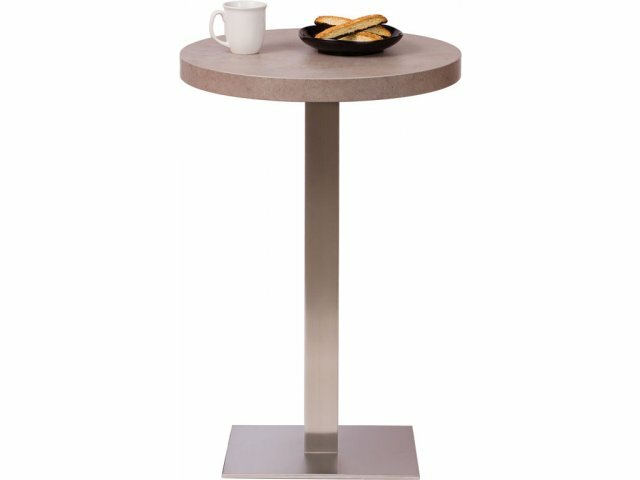 With a bar-height bistro table, any eating space can feel like a posh coffee shop or eatery. This contemporary dining choice will help employees unwind and return to work refreshed and feeling better than ever. These café tables are designed to fit in spaces of any size or shape. Lightweight honeycomb-core tabletops are available in a selection of sizes, in round and square tabletops. A selection of base shapes and top colors lets you choose the perfect combination for your cafeteria, library or lobby. Transform your space into a modern professional’s dream with bistro tables from the Midtown collection. Barsky Fleming's high quality products have been servicing the food and hospitality industry with pride for over 60 years. Their wide selection of cafeteria tables stand out for their durability, strength, low maintenance and aesthetic appeal. A honeycomb core creates a lightweight table that still offers plenty of support. Laminate creates a smooth, scratch-resistant surface that is easy to clean. Sleek Base: Modern stainless steel looks great with any décor. Great Selection: Available in a range of shapes and sizes with a choice of bases. Smooth Finish: Laminate finish resists damage. Lightweight Material: The 1&frac78;” thick honeycomb-core tabletop is light and durable. Strong Build: Bolts, nuts and screws provide lasting connections.